It's been a few years since I was last at Wagyu Kaiseki Den. Well... it used to be my venue of choice for kaiseki in this town, but I kinda stopped going ever since Tenku RyuGin (天空龍吟) opened. This was a good opportunity to revisit. 1. Grilled hamo conger-pike, matsutake mushroom (鱧 松茸 焼浸し 菊菜) - the seasonal pike conger (鱧) was lightly grilled and which, together with matsutake mushrooms, perilla flowers, and some yuzu, made for a very fragrant start. 2. Braised abalone, maitake mushroom with abalone liver sauce (鮑酒蒸しと芋茎 舞茸 法蓮草 肝餡 生姜胡椒) - the slices of abalone were very nice and tender, and it was interesting to see abalone liver sauce in this dish. 3. Misuji beef shabu and fresh figs roll, ginkgo nut with sesame sauce (ミスジしゃぶ無花果巻 新銀杏 舞茸 胡麻だれ) - WOW! Very thin slices of marbled shoulder blade (ミスジ) were blanched shabu-shabu (しゃぶしゃぶ) style, and wrapped around a chunk of fresh fig. Loved the sweetness of the whole thing. Came with the typical acidic sesame sauce (胡麻だれ)... and garnished with finely chopped chives and some perilla flowers. Bowl: Grilled kinki fish, bean curd dumpling, shiitake mushroom in clear soup (椀物：北海道 香深浜産蔵囲利尻昆布 焼喜知次 湯葉真丈 つる葉 椎茸 松葉柚子) - the grilled broadband thornyhead (喜知次) had a nice, smoky fragrance. Very delish, as it should have been. The dumping was nice and soft like a marshmallow. A very good bowl course. There was also cherry tomato with some jelly. Sea urchin and glass shrimp (雲丹 白海老) - yum. 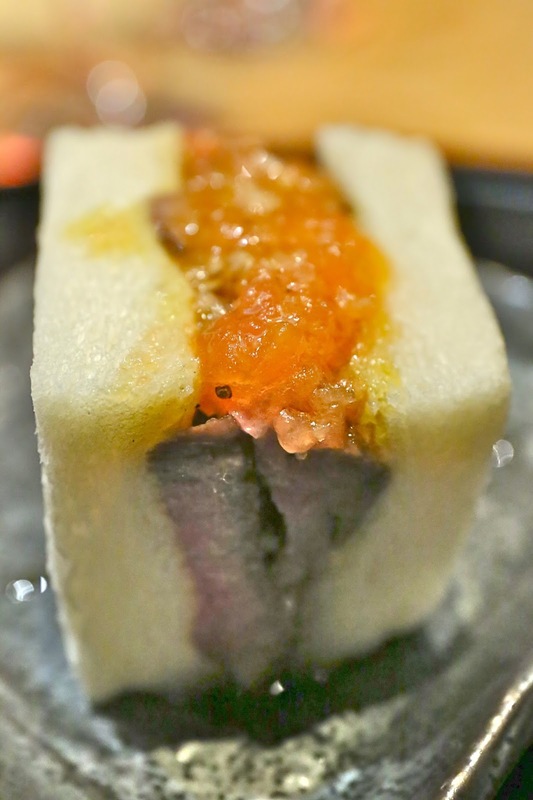 Summer hassun: Manganji pepper roll with eel sushi, seared sweetfish taro, grilled mugwort mochi cake, chilled sweet corn mousse, sweet egg with pumpkin, braised octopus (夏八寸：万願寺鰻射込み鮨 火取り鮎蓼酢 絹かつぎ 蓬田楽 玉蜀黍ムース 南瓜玉子 鮹柔らか煮 酢取り紅心大根) - there's always a lot going on with hassun (八寸)... and it's one of the reasons I love kaiseki. The corn mousse was nice and sweet, the mugwort mochi cake nice and fluffy. The egg with pumpkin hidden underneath the maple leaf was an upgrade from the usual. The octopus and indeed very soft, and the sweetfish decent. The sushi with eel and Manganji pepper was a nice surprise. Eggplant cauldron: eggplant dumpling stuffed with chicken meat and kuruma shrimp with grated turnip sauce (茄子釜：茄子饅頭 青森地鶏 車海老 平茸 おりし餡 九条葱と茗荷 鬼生姜) - so this came in a ceramic cup designed like an eggplant, and was capped by the top of a real eggplant. Inside the bowl were eggplants with chicken and shrimp. The kujo spring onions (九条葱), myoga ginger (茗荷), and minced ginger garnish on top added some final touches that brought out the flavors. Steak and tomato sandwich - that wasn't originally on the menu, but the kitchen added this additional item since they know my host likes it. And so do I! It's been years since I hast had these phenomenally delicious finger sandwiches. Thin slices of grilled beef, with a lovely sauce made with ripe and sweet tomatoes, all wrapped between two slices of fluffy, milky toast. INHALED. Main course: charcoal grilled A-5 wagyu tenderloin, variety of vegetables (主菜：和牛テンダーロインA-5炭火焼 季節野菜そえ) - well, the name of the restaurant starts with the word "wagyu"... so it's no surprise that the main event here is always going to be Japanese beef. And they never fail here. Rice: sea urchin with truffle rice served with pickles and red miso soup (食事：海栗 トリュフ 土鍋ご飯) - the other signature dish is the rice casserole, and tonight we had sea urchin with black truffle paste. A very nice bowl, with plenty of fragrance from the black truffle paste, and the smooth textures of the sea urchin. Chef selection dessert (シェフセレクションデザート) - along with the chunk of mango, pear, and the white grape, we also got some coffee mousse topped with vanilla ice cream and foam made with soda and milk. But... this was a "pairs dinner" to taste wines, and everyone was incredibly generous with their contributions. We ended up with 16 bottles for the 9 of us... HIC! 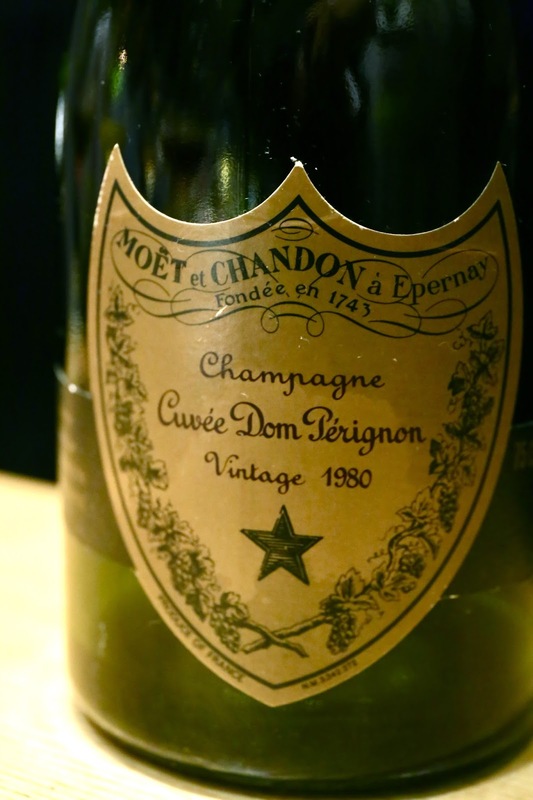 1980 Moët and Chandon Cuvée Dom Pérignon - definitely corked, with green and grassy notes. Nicely caramelized nose otherwise, with manuka honey, orange blossom water, and nice and toasty notes. Drank wonderfully on the palate with good acidity still. 2001 Kistler Chardonnay Cuvée Cathleen - plenty of sweetness in the nose, rich and butter, with a little toasty corn. Fattier and flabbier of the pair. 2003 Kistler Chardonnay Cuvée Cathleen - much bigger nose of toast, almost burnt rubber. Flinty and sharper, with perhaps acetone notes, along with lemon. Sharper acidity here on the palace. 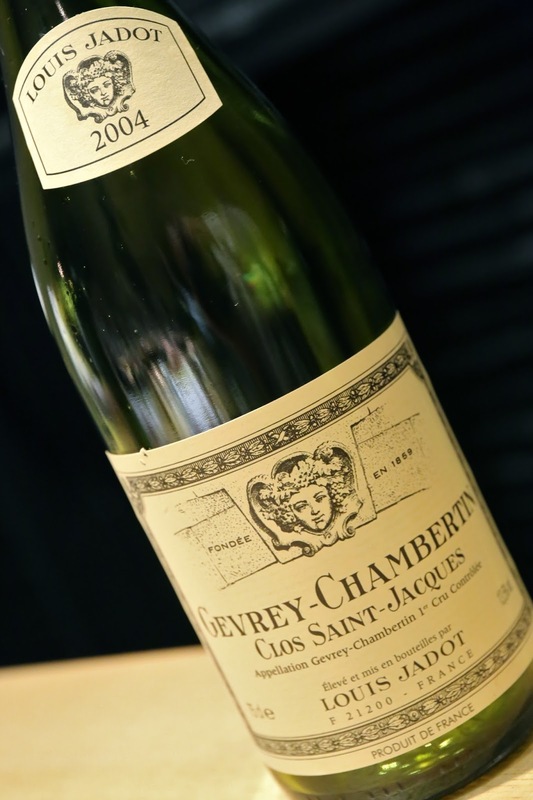 2004 Louis Jadot Gevrey-Chambertin 1er Cru Clos Saint Jacques - nice fruit with some exotic spices, a little animal. Later more mineral and savory. Pretty acidic and grippy on the palate at the same time, but surprisingly light mid-palate. 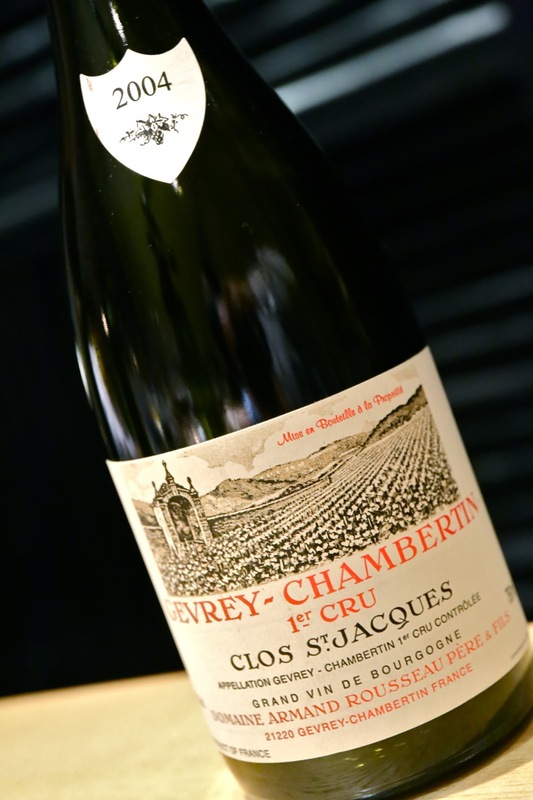 2004 Armand Rousseau Gevrey-Chambertin 1er Cru Clos Saint Jacques - a beautiful wine. More animal and leather notes, a little smoky. Almost some savory notes. Floral and lovely. 1995 Claude Dugat Gevrey-Chambertin 1er Cru Lavaux-St.-Jacques - a little ripe and sweet, with stewed prunes, but also seemed a little stemmy. Pretty grippy on the palate. 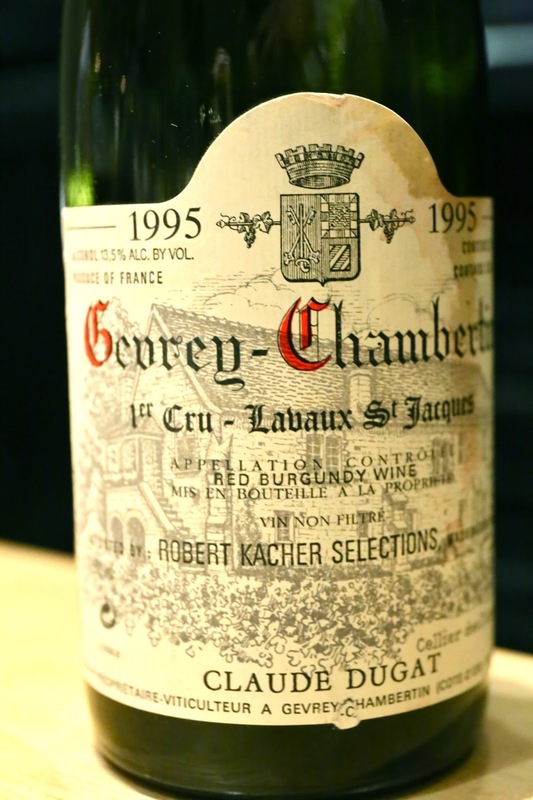 1995 Dugat-Py Gevrey-Chambertin 1er Cru Lavaux-St.-Jacques - very savory nose, perhaps a little cooked? Got a ton of sediment in my glass. Not very enjoyable. 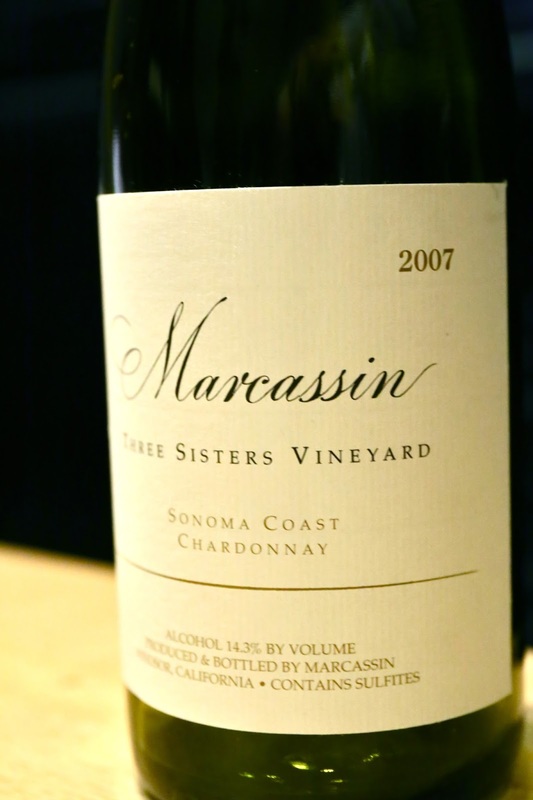 2007 Marcassin Chardonnay Three Sisters Vineyard - really nice and toasty, beautiful, lovely acidity, with ripeness on the palate but not too much... a little round and nice on the palate. Nice focus here. Simply an awesome wine! 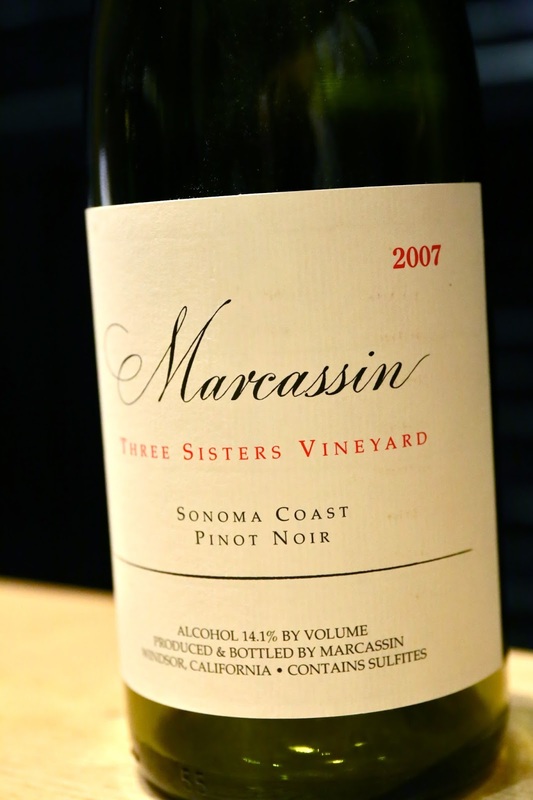 2007 Marcassin Pinot Noir Three Sisters Vineyard - really sweet and almost minty, lovely fruit, with ripeness but not quite to the point of jammy. A little leather notes here. 2003 Roumier Chambolle-Musigny 1er Cru Les Cras - corked with lots of green notes, and some leather. Lovely and ripe on the palate. 2004 Roumier Chambolle-Musigny 1er Cru Les Cras - a little forest, cool fruit here, nice and pleasant on the palate, not too heavy and tannic. Very elegant. 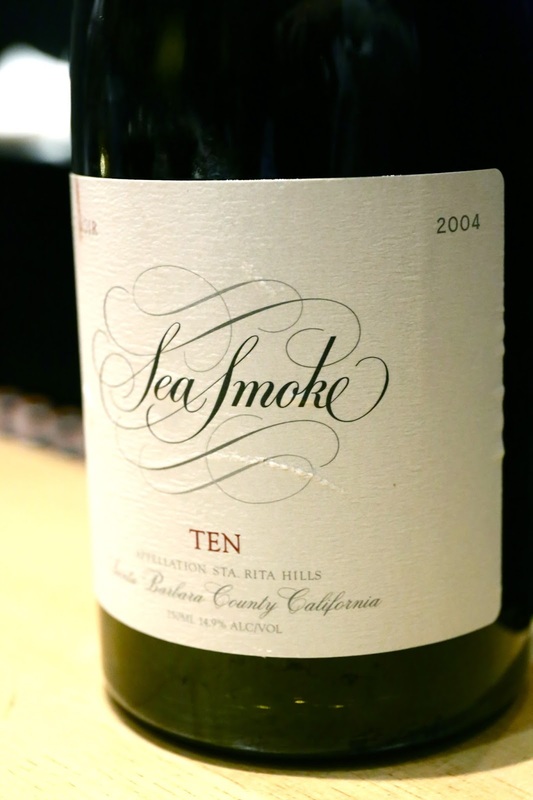 2003 Sea Smoke Pinot Noir Ten - a little metallic, burnt rubber. A little lean on nose but not on the palate. 2004 Sea Smoke Pinot Noir Ten - nice and ripe fruit here, with a little rubber. Lovely. 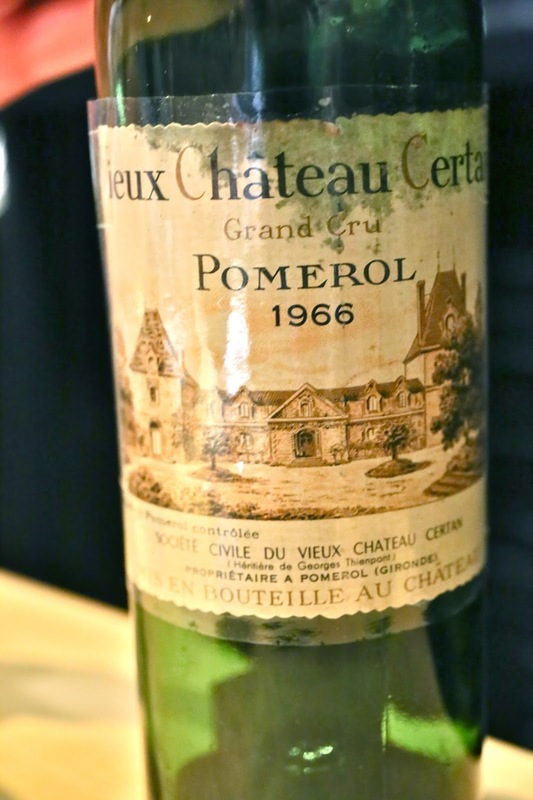 1966 Vieux-Château-Certan - a little mature, dusty on the palate, very savory. Very smooth but slightly acidic. 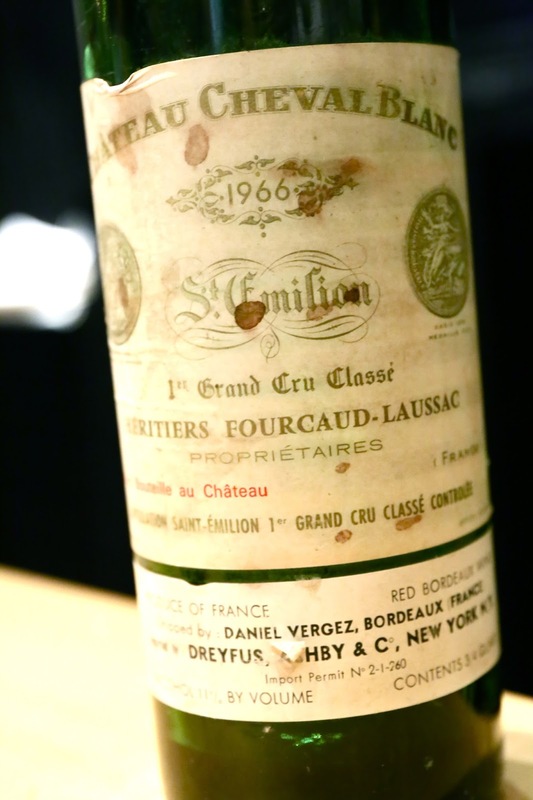 1966 Cheval Blanc - a little ripe on the nose. Nice acidity. 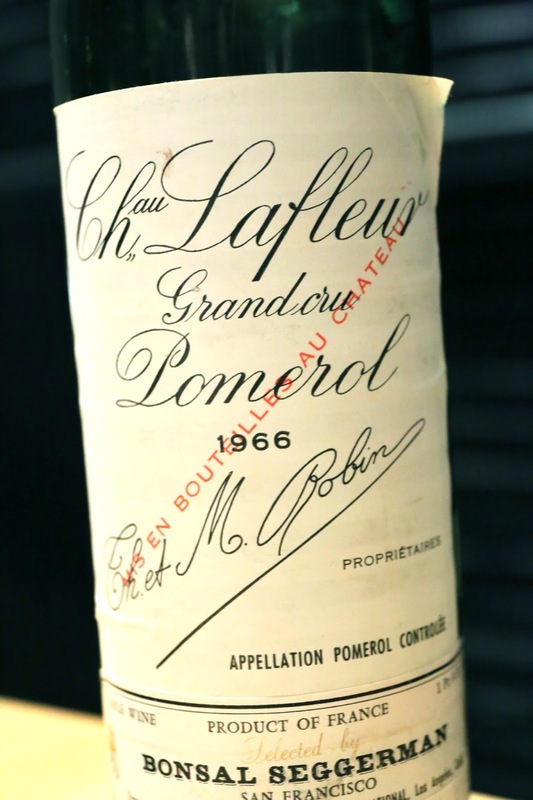 1966 Lafleur - a little vegetal and green pepper on the nose, with some fruit here.